The electrical receptacles used in Albania are type C and type F. These are 2 variants of the same receptacle - one grounded (with an earth pin) and the other ungrounded. 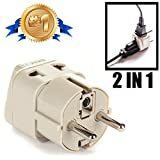 You will therefore need a US to type C/F adapter in order to plug in your appliances. Special considerations - Socket types F and L are the norm. The type L sockets typically accept both large (16A) and small (10A) plugs. 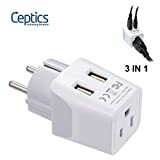 Both F and L sockets accept type C plugs (Europlug). Voltage has been harmonized to the EU standard of 400/230V but is typically delivered at 380/220V.